The venom of one wealthy parent of a selective-enrollment high school student trumped the informed and active concern of a parent leader for the entire Chicago public school community in the Sun-Times, Sunday, July 22, 2012. 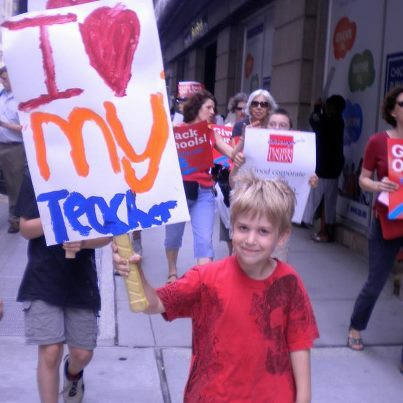 Above: Substance's Josh Schmidt marches in the June 2011 informational picket, proudly sharing his love for kindergarten teacher Marcy Morales. Another picket is planned for Wednesday, July 25. Teachers and supporters will have to work hard over the next few weeks to counter the intense teacher-bashing and anti-union bias of Chicago's mainstream media, as evidenced in Ros Rossi's prominent featuring of the odious north side mom Anna Coleman. While the Sun-Times allows Raise Your Hand founder and activist Wendy Katten a few sentences to question the wisdom of pushing the schools to an unfunded 7-hour day, it prominently features an Edgebrook mom of a Northside College Prep student who is obviously very pissed off about "unimpressive" high schools, no freshman orientation, rising school fees, and a potential strike that would be "the final nail in the coffin." The disgruntled mom says if teachers strike, "I am going to look for another house" in the suburbs. In addition, the Sun-Times gives the mom the three final paragraphs of the piece to espouse anti-union, teaching bashing drivel. Teachers and union supporters need to cling to the strength and righteousness of our cause, and as CTU President Karen Lewis has suggested many times, keep talking to our neighbors and colleagues to combat all the misinformation. One of the ironies of this particular piece of teacher bashing propaganda from the Sun-Times is that back in June, on the last day of school, the same reporter went to Edgebrook Elementary School, and couldn't find a parent who disagreed with the teachers there who had just voted (virtually unanimously) to strike. Now that the Sun-Times is under new owners (a bunch of Hedge Fund guys who are fans of Rahm; they seem to think there is a Pulitzer Prize for the most days a daily newspaper puts a photograph of the city's mayor on Page One), for all the rest of us know, they might have sent some of their underlings through the streets of Edgebrook and Sauganash in a sound truck calling out for someone who hates public schools and unions. Otherwise, the question — worthy of the Columbia Journalism Review — has to be this: "How does a reporter find one teacher-bashing, smug, wealthy, union buster when the community up there is filled with teachers, parents and students all of whom are teacher union supporters?" Given the threatening turn in Chicago teacher contract talks last week, Anna Coleman is thinking of selling her house in leafy Edgebrook — again. Unimpressed by most Chicago public high schools, Coleman checked out 50 suburban homes in the last two years. The hunt stopped the day her daughter was accepted for fall admission to Chicago’s coveted Northside College Prep, the state’s highest-scoring public high school. But since then, the district’s budget problems killed off Northside’s freshmen orientation program. School fees to rent a laptop computer if her daughter doesn’t buy one have skyrocketed, Coleman said. The anxiety level of many parents across the city ratcheted up a notch last week as word emerged that both the Chicago Board of Education and the Chicago Teachers Union had rejected a long-awaited fact-finder’s report on how to resolve teacher contract talks that have festered since November. Fact-finder Edwin Benn’s report made public the huge official gap between the final offers of both sides, then suggested raises of 15 percent to 18 percent in the first year of a four-year contract, based largely on the 20 percent longer school day and year touted by Mayor Rahm Emanuel. District officials quickly dismissed the pay suggestion as unaffordable. But parents, students, teachers and administrators have a little bit of breathing room — at least a month. The release of Benn’s report last Wednesday started a 30-day calender that translates into an Aug. 20 strike date at the earliest. That would come one week after one-third of kids start year-round classes Aug. 13. The remainder begin Sept. 4. Fueled by anger over a canceled 4 percent raise coupled with a longer school day, a record 90 percent of CTU members last month authorized a strike, if necessary. However, the union’s House of Delegates still has to set a strike date, and CPS officials are entitled to 10 days notice before any strike occurs. Chicago Principals Association President Clarice Berry last week put the chances of a strike at “50-50.’’ The CTU’s last strike, in 1987, lasted 19 days. However, Berry wasn’t ready to endorse CTU demands for a form of job protection that would impinge on a principal’s ability to select staff. Hinting at an opening for horse-trading on pay, Sharkey said job protection “is worth something to us,’’ given the expansion of charter schools and school closures, phaseouts and turnarounds that displace scores of teachers every year. The CTU wants to require principals to fill openings first from a pool of “effective’’ veteran teachers to give them a leg up on rookie teachers who compete with them for jobs, Sharkey said. “We know that teachers just starting out have a 50 percent [dropout] rate. It’s actually a job that lot of people can’t do,’’ Sharkey said. “This is something that would not only be the right thing to do, it would help settle the contract” with a smaller pay increase. However, Berry said Chicago principals won the right to pick their staff with the 1988 Chicago School Reform Law. Since then, the pressure to produce results has only increased. Longer school day on table? Some parent groups seized on Benn’s suggestion that the district roll back its longer-day plans if it could not afford Benn’s salary recommendations. School Board President David Vitale said the system was committed to the longer day but refused to bargain in public about whether to phase it in or shrink it, at least initially. She urged the district to begin its systemwide longer day at 6½ hours, up from the 5¾ now common in most schools but less than the 7 hours demanded by the mayor. However, Edgebrook mom Coleman said the system is long overdue for a longer school day, and teachers don’t deserve any more job protections than anyone in the private sector, where laid-off people with decades of experience are competing for jobs with kids out of college. “It’s outrageous that in this economy, with CPS being underfunded and emptying out their reserves [to balance their budget], that anyone would ask for a 25 percent raise” over two years, said Coleman, an interior designer who has been looking for work for four years. If the person in your story is real or a combination of different parents fused by you into one story I still find your article weak. A mother from Edge brook threatens to leave the city if her kid has to to to school with “Them”. Even after all the dancing around, that is the moral of her story. Thus the real Middle Class fear is exposed. Having been a teacher for 41 years, I know of many situations where parents have moved out of Chicago. During the 70s and 80s many of the Black faculty at Simeon moved out, so this crosses all races. The reason is simple — Many Chicago neighborhoods are war zones. The reporter wrote about the pathetic reasons this lady wants to move, but totally ignored the situation on the ground. If the lady gives up a slot at Northside Prep she is nuts. I believe the lady is real. I did a quick Internet search and found an Anna Coleman with the Edgebrook Neighborhood Assoc. It listed a maiden name which helped me locate her on Facebook, listing her interior design background and Wilmette Catholic school background. The only thing about rich people is they demand things for their children that all people should demand — for all children. I used to tell the parents at my sons' school, when we were pushing for more recess (within the 5 hr. and 45 min day there was still a place for recess): "Let's do like the rich people. The people in Wilmette would rise up if their kids didn't have recess." In my 27 years of teaching, having had 25 student teachers and assisted hundreds more, I have seen many with MAs & BAs as the last sentence of the article suggests, come and go! I welcome them personally. I have seen a tough, tough 6'4 Marine break down and cry, in the office away from the students, because he did not know how to control the students. Classroom management is a skill and an art and takes time and experience to master. I have seen business men and women who ended up teaching to a few of the best students while letting the rest do as they please because they can't cope with the various disruptions that arise. I have seen wealthy, powerfully connected individuals, one of whom attacks Chicago Public School teachers on a regular basis, not have the "right stuff" as I call it and decide that they need to head back to school for a law degree or become a cpa. The turn over rate in our system is high. It is even higher in the Charter schools. No one in their right mind wants to stay in a job where they are constantly bombarded with how bad they are as a teacher and how all of the ills of society fall squarely on their shoulders. That's what the verbal assault from our Mayor and others in his group does to the newbies, they can't take the heat so they leave. No one wants to stay in a job when they realize that they have to jump through new hoops every 3-4 years as some connected person or group to the Mayor comes up with a new improved way to teach. Meanwhile we are on "experimentation" number 21 of our students. Someone makes their money and moves on, leaving us with 3-4 years of wasted lesson planning etc. No one wants to stay in a job that has no longevity regarding pension. come on in, stay for a few years, then MOVE ON! We don't want you hanging around. Make way for new blood. So our students will have a steady stream of new teachers, just learning the ropes. Goodbye experienced veteran, hello newbie who will be gone in a few years, back to school most likely. SO Sun Times, bring 'em on! Let's see how long they last!! I remember going to the Annual Meeting of Education Reporters, Writers and Editors (EWA) in Chicago back in 2003. I was stunned by the sarcasm and snide remarks used by Rosalind Rossi to describe teachers. She bragged about the newspaper series she wrote about how dumb Chicago teachers are. She seemed to be trying to outdo Kati Haycock of Education Trust in negative remarks about teachers.